We are a grower and distributor of Trees and Farm Seed. From our farm at the source of the White River, we grow quality fruit trees, hardwoods, flowering trees and shade trees. We grow vines and shrubs and are your source for grapes and berries. We are also broker for buyers and sellers of speciality farm seed, and you can book your seeds online now for heirloom vegetables, flowers, trees, and herbs. We can deliver seeds worldwide, and plants within the U. S.
Before placing your order, please read the website terms below, the Frequently Asked Questions linked below, and the Terms page linked below, which, together with the catalog pages of the individual items that you will order, constitute important parts of our terms of sale. We are happy to be part of your growing success and bountiful harvest. We take the security of this system of commerce and our customer's privacy very seriously. We diligently protect all information that we collect for this process. We do not sell any names, email address or other customer information. We maintain a list of customers' email addresses and other correspondents' email addresses that we use to send periodic messages regarding our products and services. If you do not wish to receive such email from us, please let us know. Copyrights cover the entire website as well as any part. No permission is given to copy or in any way reproduce any file, text, or image, in whole or part; with the exceptions below, which are to be used strictly within these terms. whiteriversource.com would like to encourage anyone who would like to link to our site to do so within the conditions stated below. 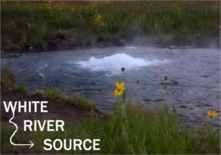 Use or Publication of White River Source and whiteriversource.com, trade name and trade mark is restricted. The conditions below must be met. 1. Each occurrence of the trade name or trade mark itself be a direct link to a document on whiteriversource.com, or that it is closely and clearly accompanied by a prominent and working direct link. 3. Your site has a relevant connection or is a useful data base, directory, or list. 4. You have not been notified by us to stop using our name in your publications. We would also request that you use our graphic logo button when possible. White River Source is a grower and distributor of Trees and Farm Seed. We grow quality fruit trees, hardwoods, flowering trees, shade trees, vines, shrubs and are your source for grapes and berries. We are also broker for buyers and sellers of speciality farm seed, and you can book your seeds online now for heirloom vegetables, flowers, trees, and herbs. We can deliver seeds worldwide, and plants within the U.S. The information on the whiteriversource.com Website may contain errors and/or may not be complete or current. whiteriversource reserves the right to correct any errors, inaccuracies or omissions and to change or update information at any time without prior notice.